Gary Rome Hyundai Dealer Blog - A Gary Rome Hyundai Site (888) 637-4279: 2016 Hyundai Veloster Rally Edition: Does it have the cool factor? 2016 Hyundai Veloster Rally Edition: Does it have the cool factor? For 2016, Hyundai has dialed up the Veloster with the Rally Edition, a proper special edition intended for the enthusiast. While that may sound like an ambiguous name for this trim level, it represents what should be the most coveted Veloster built to date. The Rally Edition is available in one specification, starting with the striking and unusual matte blue paint, and contrasted by an abundance of black trim. The black, 18-inch RAYS wheels lend a purposeful look, with their straightforward, race-like design. Cool factor +1. You can’t miss the large, black front grille, and whether you love it or hate it, it’s distinctive for the category. The dark grey, faux carbon fibre front spoiler and rockers contrast the blue paint, but Hyundai’s not fooling anyone with these obvious imitations of the real thing. Cool factor -1. At the back, the hatch itself contains two pieces of glass that give it some real heft, and you’re reminded of its mass every time you open and close it. The highlights of the Veloster’s tail are the LED tail lamps and the central, twin tailpipe. Sure it would have been easier to put a boring tailpipe exit at one side, but this gives the Rally Edition a premium look. Cool factor +1. As stunning as the paint is, before buying a Rally Edition make sure you understand that it requires special care to maintain that flat finish. It’s definitely a commitment. The first time I sat behind the wheel I was impressed with the Veloster’s simple and effective cabin. Secondary controls are straightforward and the learning curve was non-existent. Other manufacturers should really take lessons on interior design from Hyundai. One of the only hints that this car was designed a full life cycle ago is its thin-rimmed steering wheel. Seating position is always critical for me, whether it’s comfort, sightlines, or the fundamental human-to-car interface, and this Veloster is excellent in every way, save some loss of rear vision through the hatch. The seat, pedals, wheel, and shifter are perfectly positioned in relation to one another, and there’s more than adequate adjustment from the seat and steering column to find that ideal driving position. Cool factor +1. However, as much as I enjoy sitting in the excellent driver’s seat, a hot hatch just should not have leather upholstery, nor should it have bold, juvenile “Turbo” scripting on the outboard bolsters of both front seats. Give me a choice of cloth, please, and I don’t need to be reminded that I’ve got a turbo every time I open the door. Cool factor -1. At this modest price point – $26,999 – this isn’t the priciest Veloster you can buy, but there aren’t any options, and that’s alright because you really don’t need any more than what’s here. There’s a decent sound system, Bluetooth, and a key instead of a start/stop ignition button. While it’s not a twin scroll-type of turbocharger, it is integrated into the exhaust manifold for quicker spool up, and that results in virtually non-existent turbo lag. Very impressive. The engine is unchanged from Veloster Turbo spec, and makes 201 horsepower and 195 pounds of torque, with peak torque available from a low 1,750 RPM. The Rally Edition is specified with just one transmission which is, thankfully, a six-speed manual. Perhaps the highlight of driving the Rally Edition is the superb B&M short shifter that’s fitted to the six-speed box. Everything about it is fantastic – feel, throws, and precision – making it one of the best front drive shifters I’ve used in a long time. Cool factor +1. The Rally Edition hits a home run with its thoroughly revised suspension, with unique anti-roll bars, springs, and, most importantly, dampers. The last Veloster I drove had an average, at best, suspension set up, but this Rally Edition is on an entirely different level, and that’s really due to the dampers. You see, you can make the platform as rigid as you like, but if the dampers aren’t valved to match the suspension’s dynamics, you might as well throw it all away. In the Rally Edition, the dampers do a superb job of controlling wheel and body motion, and I didn’t encounter a single situation where I felt less than complete confidence behind the wheel. That said, I didn’t test it on track to perfectly deconstruct its on limit handling, but I can’t imagine many owners tracking theirs, either. Still, the chassis’ overall on-road manners are impeccable. At just over 1,300 kilograms, The Velsoter Rally Edition doesn’t feel as lithe as the Ford Fiesta ST (which weighs in at over 100 kilos less), but that’s not entirely bad because the additional weight does the car some favours, keeping the power-to-weight ratio in check. Unless you’re a complete hoon, torque steer is minimal and you’ll rarely overtax the front tires under acceleration. Speaking of which, the faux limited slip system works unobtrusively. Instead of using a mechanical limited slip differential, the brake system slows the inside front wheel under acceleration to mitigate wheelspin. It’s as subtle as the Fiesta ST’s system, and that’s a compliment. Great feel and modulation from the brakes, as well as precise steering, lend the driver even more confidence. This is one Hyundai that’s a total blast to drive. Speaking of the Fiesta ST, the Veloster Rally Edition is a near match in terms of power-to-weight, however, the Fiesta ST rolls out of the showroom at $3,000 less than the Hyundai. At $26,999, the Rally Edition’s pricing aligns it with the Focus ST at its price of $27,806. However, the Veloster doesn’t suffer from tragic torque steer like the Focus. On the other hand, a base Volkswagen GTI, the gold standard in hot hatches, costs just $1,500 more than the Rally Edition. Potential owners will want to consider that the Rally Edition requires only regular fuel and its impact on running costs. To determine if this was indeed true and without ill effect, I ran my tester on regular fuel in the heat of summer and found no downsides. Plus, in mixed driving, both foolish and restrained, the Rally Edition averaged 11.6 litres per 100 kilometres during the test. Both Fiesta and Focus ST used more fuel on average during my previous tests. 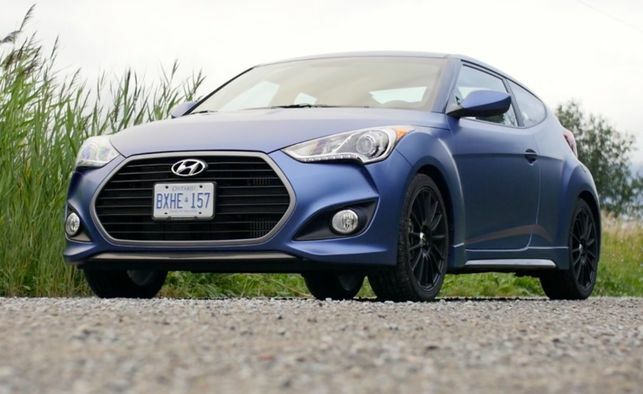 While I never thought I’d say this, the Veloster Rally Edition is a Hyundai that delivers decent all around performance with satisfying handling. For all the conversations I’ve had about this car, there is one common thread and that is that the Rally Edition is what the Veloster should have been in the first place. By way of its key virtues, those being its competent and enjoyable dynamics, excellent seating position, and fantastic shifter, this is car that’s worth considering if you’re looking for an enthusiast oriented hot hatch.